At the beginning of this year, I made a promise to myself to be a healthier person. A part of that promise was making changes to my diet. During the holiday season, I failed miserably at eating right. Overwhelmed with the holiday season and deadlines looming, I often opted for quick, convenient, but totally fatty foods. I had lost some weight before the holidays approached and gained it all back and then some just in time to celebrate Christmas. January 1st, my husband and I started the new year with a long morning walk in the park. It was right then and there, in the middle of the walking path and evergreens, that I decided that something had to change. That was one of the best decisions I’ve made this year. I feel better, I look better, and even though my diet has completely changed, I eat better! I’ve learned that seasoning is everything! So today I want to talk about everything seasoning! I basically eat a low carb, high protein diet these days. Bagels don’t happen very often unless I buy a package of gluten free everything bagels. Let’s face it – they’re just not the same. But I do have everything seasoning that I’ve made with poppy seeds, sesame seeds, minced onion, minced garlic, and sea salt. I originally made the seasoning to use in an Everything Popovers recipe. Since then, I’ve used it to season other foods, as well. While I was grocery shopping a couple weeks ago, I happened to browse the hummus case and saw an “everything” flavored hummus. I immediately knew that I had to make my own. I already had everything I needed, but I picked up some tahini. Tahini is a sesame seed puree that is used in traditional hummus recipes. Usually, I leave it out out my homemade hummus, but only because I never feel like buying it! This “everything” hummus turned out great! I had a ton of veggies in the fridge to cut up for dipping and toasted some garlic naan, as well, to cut into triangles. I would also suggest dipping pita chips or even bagel chips into this hummus. This hummus definitely has all of the flavor of an everything bagel without the carbs (of course, that depends on what you dip into your hummus). 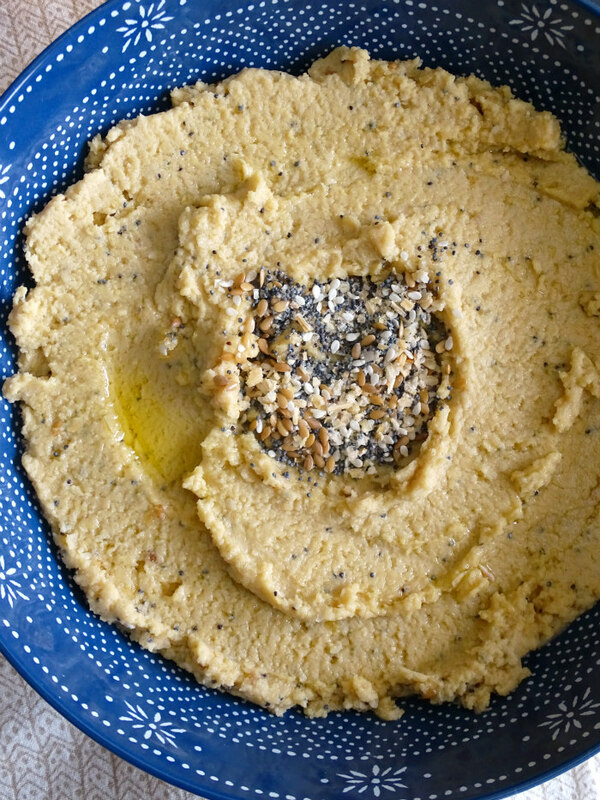 Add chickpeas, tahini, lemon juice, and olive oil to a food processor or blender. Pulse until smooth. Add a tablespoon of olive oil at a time to help move the hummus along. 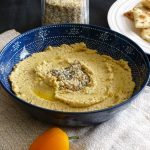 Once the hummus has reached a smooth and creamy consistency, remove from blender and scoop into a bowl. Stir in garlic powder and everything seasoning. Create a small well in the center of the hummus and add a little everything seasoning. Drizzle with olive oil and serve with veggies, pita chips, bagel chips, or toasted naan for dipping. To make everything seasoning: mix poppy seeds, sesame seeds, minced onion, minced garlic, and sea salt in a jar. Mix equal amounts of each ingredient. Keep seasoning stored in a sealed container to season dishes. If you’re living a low carb lifestyle, you don’t have to miss out on the taste of everything bagels. This hummus has it all! Plus, it packs healthy fats and a good source of protein. 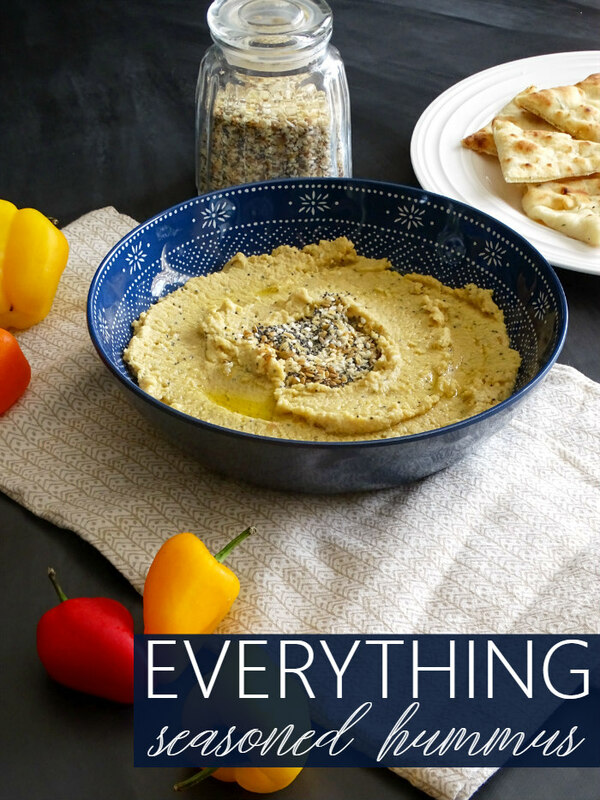 What will you dip into this everything hummus? What’s your favorite hummus flavor? Thanks so much for pinning! I hope you enjoy this recipe! This is a loaded hummus and I love it. I haven’t tried something similar, but I think I have to try this one. Thank you for sharing at Fiesta Friday party. Thanks so much! 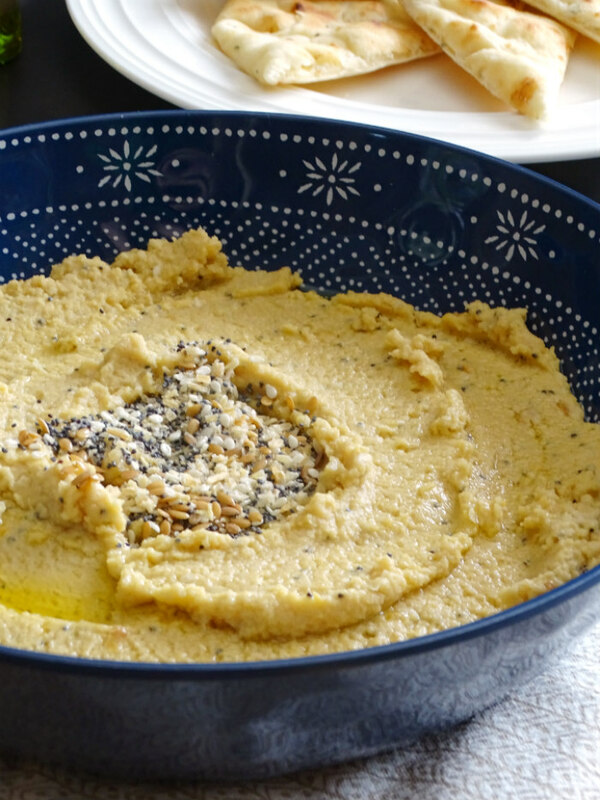 Enjoy this hummus recipe! I love hummus and I love everything bagels, this is a win-win! Can’t wait to give it a try! Saw it at #OMHGWW. I agree with you Jessica that seasoning it everything! My mom always said that with the right seasoning anything can taste delicious! I like your idea for “everything” seasoning! The hummus must taste delicious! Thanks for sharing it here at FF! Your mom is definitely right! 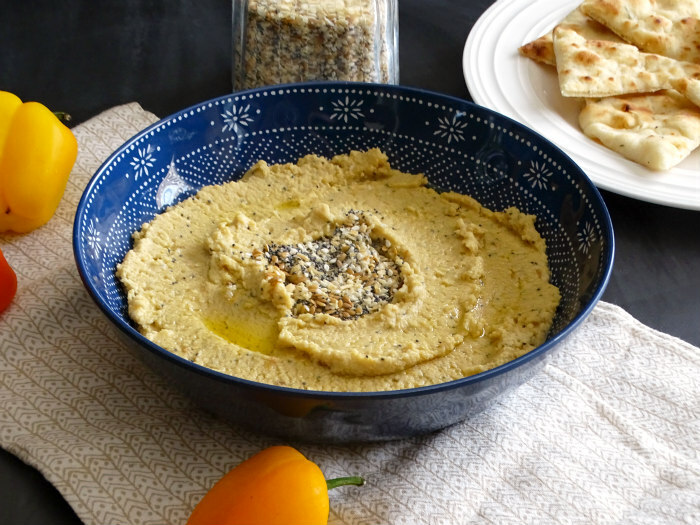 Seasoning is everything and this hummus surely has a lot of flavor! Thanks so much! I can’t wait to try this! Thanks so much for sharing your great post with us at Full Plate Thursday, I really appreciate you sharing with us!